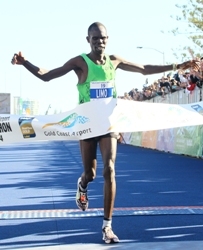 22-year old Silah Limo ran the fastest time ever recorded in Australia in his marathon debut — four seconds faster than what Rob DeCastella ran to win the 1982 Commonwealth Games Marathon in Brisbane. Race favourites Nicholas Manza and Yuki Kawauchi suufered mishap as Kawauchi fell at 20km, but finished third and Manza failed to finish. Women's winner Asami Kato broke away after 30km to set a new personal best time. The first Australians across the finish line were 44-year-old Canberra policeman Rowan Walker (11th in 2:21:47) and Tarli Bird who became both Australian and Oceania Regional Marathon champions. Melbourne-based Kenyan Reuben Kosgei returned after a three-year absence through an achilles injury to win the Half Marathon: "the aim is to be back next year to do the marathon" he said. Sydney-based Milly Clark won the women's race in only her second half marathon. "Eventually I would like to move up to the full marathon, but that distance scares me" she said. "I was in seventh until about 8km. I was feeling OK and focused on passing the next person in front of me. I misjudged the finish a little, but managed to hang on." The ASICS Half Marathon is the most popular event on the weekend run schedule with 9650 participants. The Marathon attracted a field of 5613. In a race held at 2600m altitude times were inevitably slow, but the winners benefited from knowledge of the course and conditions writes Phil Minshull. Geoffrey Kwamworor began to edge away from the rest of the field after halfway, while Rita Jeptoo strode out to win by almost two minutes. Pre-race favourite Gladys Cherono, the IAAF World Half Marathon Champion, had a below-par race and finished fifth in 1:17:14.